This is a repair log for Peter, my Cool Vanilla 2005 Chrysler PT Cruiser GT. July 20, 2015 (Mon): Purchased the car from P. Bush in Denver. Mileage: 68,015. August 7, 2015 (Fri): Installed Cellex magnetic phone mount and jewel vent knobs (quantity 4). August 14, 2015 (Fri): Installed new windshield wiper blades: Valucraft VCB20 for the left and VCB21 for the right. Mileage: 69,588. September 28, 2015 (Mon): Oil change with 5W-30 Mobil 1 synthetic oil. Mileage: 71,097. December 21, 2015 (Mon): Replaced right headlight bulb (low-beam) with Sylvania 9006XS Basic (55W)—the same part as the burnt out one. Used bulb grease to prevent corrosion. Mileage: 73,455. December 29, 2015 (Tue): Check engine light came on while driving in 2F weather on Interstate 25. Followed procedure on YouTube to get the code. 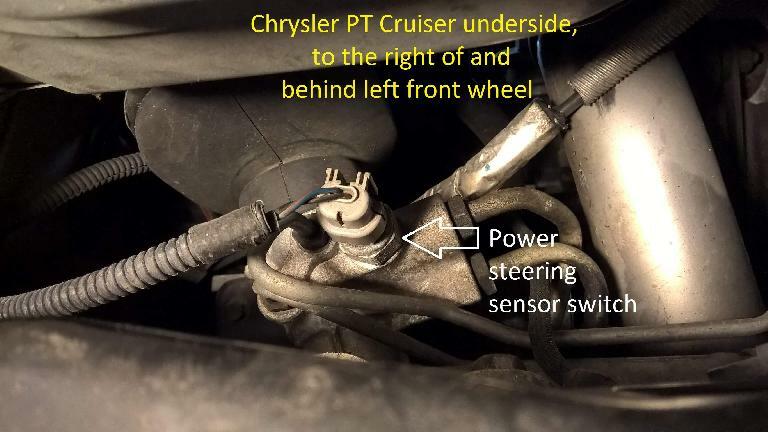 Code was P0551, which corresponds to power steering sensor switch. Good resources on this code for PT Cruiser is here and this video. Mileage when light came on: 73,492. January 4, 2016 (Mon): Jacked up car and applied dieletric grease to contacts of power steering sensor switch. Reset check engine light by disconnecting and reconnecting the battery ground cable. Check engine light did not come back on after 12 miles of driving. Mileage: 73,508. January 4, 2016 (Mon): Opened fuse box and found that fuse for fog lights was missing. Purchased 20A fuse for it, but fog lights still do not work. Turns out that a fog light fuse is only needed for PT Cruisers in other countries. Most likely culprit is the multi-function turn-signal stalk per this thread. January 4, 2016 (Mon): Checked oil level and it was at max, meaning that the car did not burn any oil in 2,323 miles. Mileage: 73,520. January 19, 2016 (Tue): Check engine light came back on again while driving back from Denver airport. Same code as before: P0551. Mileage: 73,620. May 25, 2016 (Wed): Determined that proper tire pressure for the 205/55R16 tires is 35 PSI for all four tires per this website and inflated them to such. Also noted that check engine light never came back on since resetting 1,400 miles ago. Mileage: 75,0xx. June 19, 2016 (Sun): Washed and waxed with Permaseal. Mileage: 76,364. June 21, 2016 (Tue): Reglued chrome strip on lower part of right rear door, and license plate frame holder, with Loctite silicone adhesive. Mileage: 76,364. October 29, 2016 (Sat): Washed and waxed with Permaseal. Mileage: 78,574. March 21, 2017 (Tue): Engine flush, oil change with 5W-30 Mobil 1 synthetic oil, radiator flush, and new air filter. $278 total. Mileage: 79,990. March 21, 2017 (Tue): Transfered tire ownership from previous owner of car to myself at Discount Tire, then got a free tire rotation and rebalance. Mileage: 79,998. May 26, 2017 (Fri): On way to Colorado Mesa Double Century near Glenwood Springs, was trying to pass a truck when heard a pop followed by an incessant whistling noise. Car can no longer accelerate well. Suspect intake leak somewhere. June 8, 2017 (Thu): Replaced PCV breather hose, which was split at the end that went to PCV valve. There is no more faint smell of gas or stumbling at startup or low idle anymore. 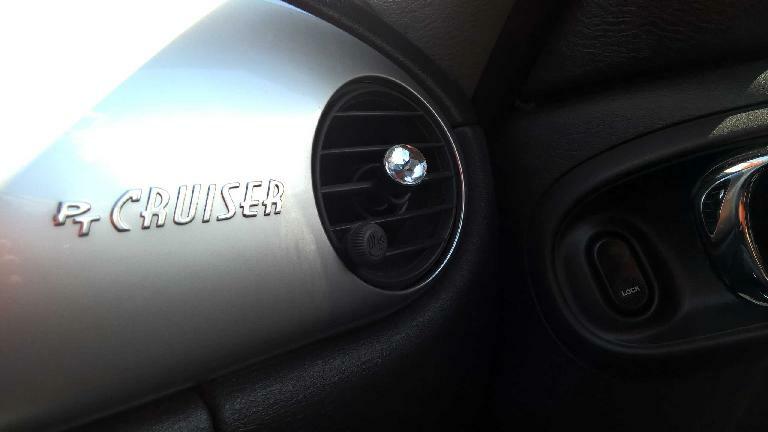 However, whistling/hissing noise is still present under acceleration and acceleration is still bad. Mileage: 81,674. June 18, 2017 (Wed): Washed and waxed car with Permaseal on the top surfaces and front before running out of Permaseal. Waxed the sides of the car with Meguiar’s Yellow Wax. Mileage: 81,677. June 19, 2017 (Mon): Brought in car to Mr. Mechanic and shop found lower intercooler pipe mounting bolt missing, which caused piping to fall off the turbo. Shop re-torqued mounting stud, replaced nut and re-secured intercooler pipe to turbo. Car now accelerates quicker than I ever remembered and seems quieter as well. Mileage: 81,681. June 27, 2017 (Tue): Car very easily passed emissions test. Mileage: 81,734. July 18, 2017 (Tue): Replaced wiper blades using Bosch Icon 20A & 20B for front windshield left and right; and Michelin 16″ blade for rear. Mileage: 82,094. March 8, 2018 (Thu): Washed and waxed with Meguiar’s Yellow Wax. Finally used up the bottle of #26 Yellow Wax after 22+ years! Mileage: 84,265. March 19, 2018 (Mon): Disabled auto-locking of doors when car exceeded 15 MPH. Procedure: cycled key from off to accessory position four times, then press the lock button on the left door, which causes a beep to sound. Procedure to reactivate auto-lock is supposedly exactly the same. April 17, 2018 (Tue): Engine flush and oil change with 5W-30 Mobil 1 synthetic oil. $149 total. Mileage: 84,562. April 29, 2018 (Sun): Radiator has been making gurgling noise ever since driving back from Grand Junction to Fort Collins despite temperature and power being normal. Added half-gallon 70/30 Xerex 5 coolant/water mixture and replaced radiator cap with new 7718 Dralast Safety Lever Radiator Cap (18 psi). Seems to have solved gurgling problem. Mileage: 85,380. April 29, 2018 (Sun): Exterior and interior detailing by RC Auto City Detail. July 17, 2018 (Tue): Check engine light came on a few days ago with codes P1604 and P0700. The first one related to transmission shifting, and indeed, car would not go into Autostick mode. Reset the codes, drove to Denver and back the next day, and check engine light did not come back on. July 19, 2018 (Thu): Replaced left front armrest with one I found on eBay since the original one had a 2″ tear in it (was like that when I bought the car). November 5, 2018 (Mon): Replaced gas cap with an OEM one, but check engine light still comes on. Also replaced the upper “lock power windows” decal in power window switch module, which was presumably vacuumed up accidentally by detailer in late June. Mileage: 89,158. November 19, 2018 (Mon): Replaced the PCM/TCM with a refurbished one. Seems to have solved the check engine light issue. Mileage: 89,958. January 10, 2019 (Thu): Replaced both windshield washer nozzles. Both of the old ones had become extremely brittle and snapped at the stem. Mileage: 91,863. March 8, 2019 (Fri): Stone cracked windshield near line of vision on I-25, after which I made an immediate detour to Novus Glass. Repaired windshield crack before it could grow larger than the size of a quarter. Novus did an amazing job—the crack is invisible now, with the only tell-tale signs being three 2mm drill marks that were injected with epoxy. Mileage: 93,750.